Wall Mount TV Installation, Surround Sound Systems, Wall Mounted Sound Bars, Wire Concealment for TV's, & Home Theater Installations, Projectors And Projection Screens. 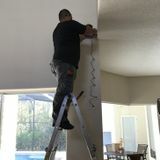 Also Electrical Work like Replacing Light Fixtures, Installing Chandeliers, Ceiling Fans, Dimmer Switches, And Making New Outlets. We also assemble any indoor and outdoor furniture.